A radio show about music, people and spaces. We walked the streets looking for people listening to headphones then talked to them about the music, their day, and the location while recording whatever they happened to be listening to. The result was a show that offered a glimpse into people’s soundtracks to the city, and how they used them to move through their day. Traffic Island Disks started out with a regular slot on London’s Resonance FM station in 2003, then grew into an internationally touring live Internet radio show. 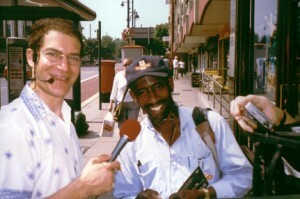 In 2004 we designed a mobile system with custom software for live mixing, editing and streaming, and teamed up with local presenters to stream the show via wifi connection from the streets of cities starting in Newcastle then touring to Bratislava, Vienna, Sofia, Aarhus and San Jose. Thanks to Maria Riskova and the Burundi Datalab for hosting us for the Bratislava section of the tour. Thanks to FreeBitflows and Interspace for hosting Vienna and Sofia versions. Thanks to Rum46 Gallery in Aarhus for hosting the Danish version, and to Christian Ulrik Andersen, Soren Pold and the Digital Aesthetics Research Centre at Aarhus University for the invitation.